Horns and the Salvation Army seem to go together somehow. It probably dates back to when the marches of John Phillip Sousa were popular. 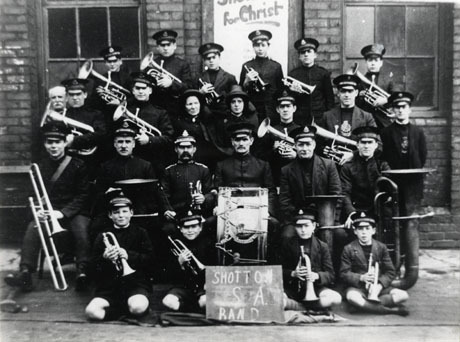 In their zeal to spread the Gospel, the Salvation Army used brass and percussion bands to get the attention of people that would otherwise flee from "church music" and "soapbox preachers." 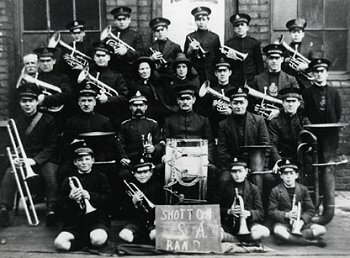 Since then, the culture has changed and brass bands don't have the effect they used to. In addition, the focus of the Army has changed. They soon learned that many of the folks they helped would need help getting back on their feet, even if they experienced a personal revival. So the modern Army works hard to help people who need help most desperately - "saved," and "unsaved" alike. In our community, there are any number of tax-exempt organizations that "do good" in some general way, but if you want to talk specifics, you talk to the Army - they do tangible work with real people every day. 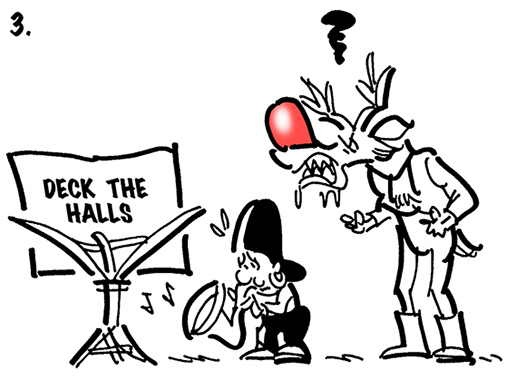 These days, when you see a horn player next to the red kettle, he or she isn't trying to gather a crowd to preach to. Rather they're hoping to spread some Christmas cheer, while at the same time calling attention to the very real needs among hurting people in our community. Yes, some conservatives accuse the Army of getting away from its Gospel mission. But, sadly, the folks who complain about that the loudest always seem to be the ones who do the least possible for the "least of these." Over the years, I've known musicians who played instruments or organized choirs to sing at the kettles. But I haven't had the chance to get involved myself until this year. I've also wondered what it would be like to "busk." Fortunately I've never had do depend on that as an income stream. In case you didn't know, "busking" is what they call it when musicians set up in some public place and play for free, with the hope that passers-by will appreciate the music so much that they'll drop some money into the hat, can, or case. Buskers include folks who are really living on what they pull in, as well as underemployed musicians looking for an audience, and maybe some extra "pin money." I didn't need the extra "pin money." But playing at a kettle would be a way to try a kind of busking without feeling like I was taking money from folks who need it more than I do. 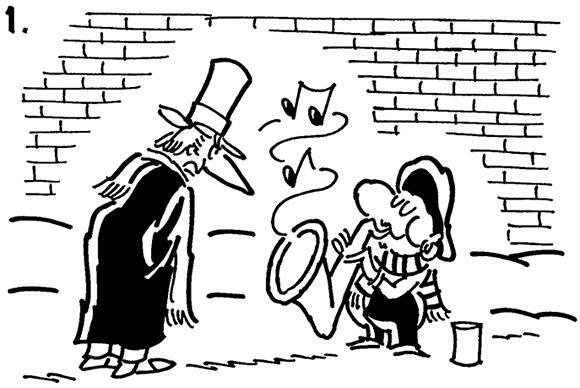 By the way, the "Busker" cartoons in this strip aren't about me - I came across them when I was doing some background research for this article, and their author, Mark Armstrong graciously gave me permission to use them here. So I contacted the local Salvation Army captain and asked if they still hired musicians to play at the kettles. He asked me to come by and "audition." That seemed odd at the time, but I threw my old Vito Alto (a Yamaha YAS-23 clone) into the car one morning and drove over to his office on my lunch hour. It turned out that he has been "burned" by self-described musicians with no discernible talent, and he just wanted to make certain I could actually play. The captain apparently considered my playing satisfactory. So I filled out the same employment forms the bell-ringers use, as well as many of the forms that the full-time staff uses. I didn't really need the money - in fact, I planned to donate it back, since we try to give something every year. But I wanted to go through the whole experience, just so I could tell other musicians who might consider this outlet. It turned out that I needed my Social Security card, just like you do for any other kind of employment these days, so I had to go back the next day so they could photocopy it for their files. Then they had to send in my application to a regional office for a background check. At the time, this was early November, and they said it could be as much as ten days before they heard back. The local captain said he'd like to have me out playing Thanksiving weekend, so I was expecting a call much earlier than it came. In the meantime, I borrowed a top hat from my sister Tess, who used it for a children's opera version of A Christmas Carol that she wrote and produced. I also practiced up as many different Christmas songs and carols as I thought I could pull off in less-than-optimum conditions, without sheet music. The one thing I couldn't practice was playing for over an hour at a time. I just literally don't have time for that. 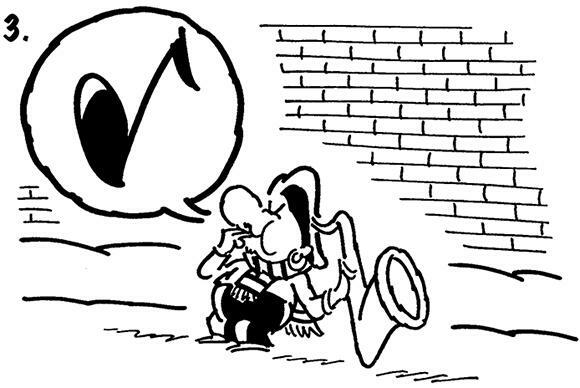 Keep in mind that horn players usually don't play for two hours at a stretch. Even if the band plays all night, the horns typically come in and out, so I didn't know how well I'd hold up in the second hour. After Thanksgiving (which was pretty busy without playing for any kettles), the captain told me that he had just received my paperwork back from the regional office and that he had passed my information to the guy who scheduled the bellringers in our area. Finally, on December 14, eleven days before Christmas, I got the chance to play - by the "general merchandise" entrance of the WalMart on Bechtle lane, in Springfield, Ohio. When I showed up, it was raining lightly, but the bell-ringer was under a slight overhang so I figured we'd be able to stay reasonably dry. 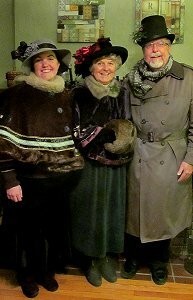 I left the top hat in the car, though, since I didn't know how well it would hold up to the moisture, and I wore one of my wool "cabby" hats. I found a place to hide my sax case, got the sax out and together and started warming up. Technically I was 20 minutes early. But people were streaming into the door, and I didn't want to waste the opportunity to get their attention. So I started right into a carol, and kept playing for about forty minutes until I took my first break. The way people responded, or didn't respond to certain songs was interesting. I had prepared about twenty different songs, but as the night wore on, I dropped more and more of them out of the rotation. For one thing, as my lip began to protest, songs that required really high notes became too much trouble to play. But beyond that, I couldn't help noticing which songs got money and which songs didn't. I know it sounds crazy, but there was a pattern to it. I realize that on another night, the pattern could be entirely different. But that night we got donations I when played certain songs and NEVER got money when I played others. 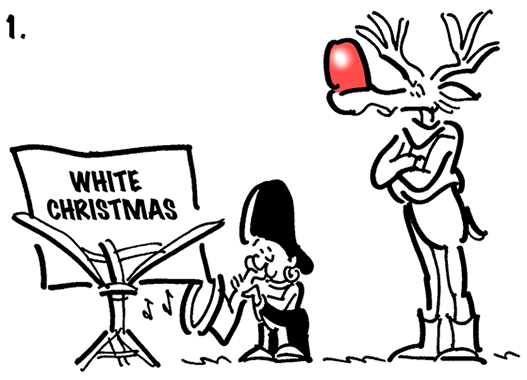 The mid-tempo well-known carols worked the best. "The First Noel," "O Come all Ye Faithful," "Angels We Have Heard on High." Slow songs like "Silent Night" were "iffy." Slow pop songs like "White Christmas" and "I'll be Home for Christmas" never worked. 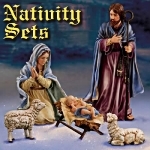 Minor-key songs like "We Three Kings" and "God Rest Ye Merry Gentlemen" never worked. "Linus and Lucy" (the Peanuts Christmas theme) worked. "Up on the Housetop" worked. 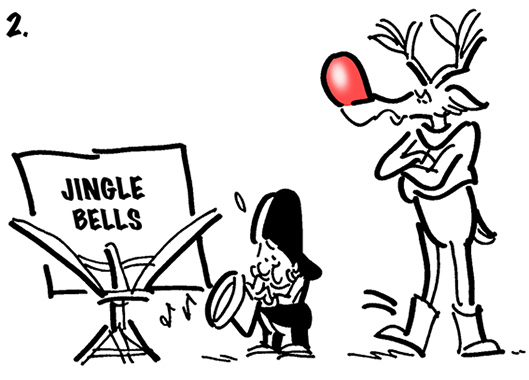 A pretty cool arrangement of "Jingle Bells" didn't. The bellringer I was stationed with was a good-natured fellow in his late fifties. He was not exactly well-spoken, but he was glad for the company. I was a little surprised that I didn't see anyone I knew, but my associate knew lots of folks who came by. It turned out that he had recently been laid off from a tool and die shop in the area. All of his former coworkers were surprised to hear that - the word at the "shop" was that he had retired on disability. They all figured he was enjoying a leisurely retirement with no idea that he was stringing together minimum-wage jobs to get by. Makes you wonder how many folks you know that have got into some difficulty and are too embarrassed to say anything. Many people said they were glad for the music. A few stayed around to listen for a bit. Several waited until I was between songs or taking a short break to say how much they appreciated it. One lady kept trying to give us money for ourselves, not for the kettle. We kept declining, but she kept insisting. Finally, because I didn't want to argue with her, I let her drop it into the bell of my sax, then put it into the kettle after she left. I won't say that people were coming out of their way to use "our" entrance, but the bellringer I was sharing a kettle with was encouraged by how many people were slowing down long enough to drop something into the kettle. Of course $1 bills weigh just as much as $5 bills, and quarters weigh even more, so it's hard to tell by weight how well we did, but as the evening wore on and other folks affiliated with the Army came by, they seemed to think the kettle was getting pretty heavy pretty fast. I was especially encouraged by how many young people made a point of giving. Several times a group of five or more teenagers would come out of the store and each would stop to drop something into the kettle. Maybe it was more about appreciating the music than caring for the poor, but to me it still counts. Young parents with small children often stopped to listen, then dropped something in. In a few cases I let kids pick the next song, and the parents definitely seemed to appreciate it. In several cases, folks who probably could least afford it were the most generous - the widow's mite, so to speak. The converse occasionally happened of course. Now, I'm sure that some of the folks who breezed by had already done their giving or were giving elsewhere - nobody can stop at every kettle they pass. But then there was the husband of a 50ish-something well-dressed woman who saw his wife starting to dig in her purse and loudly demanded that she get into their trimmed-out Escalade. 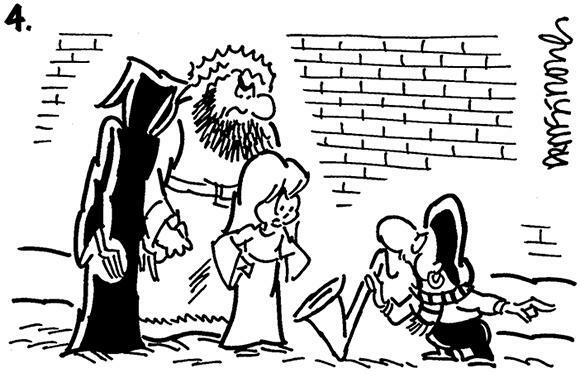 Verily, he has his reward, I suppose. Overall, though, enough people seemed so touched that I was even out there playing that I wished I was doing a better job. If their compliments were to be believed, I was not only encouraging more giving, but also turning the givers into cheerful givers, the kind the Lord loves (according to 2 Corinthians 9:7). As I had feared, I started wearing out about an hour into the night. I kept going by taking a one-minute break or so every few songs, and by playing in the low register where my deteriorating embouchure wouldn't be so critical. I apologize to everyone who came through in the last half-hour - you did not hear me at my best. About the time that I was afraid of becoming an embarrassment, the bus that was supposed to collect the kettles and the bellringers showed up. As it turned out, the driver had some bellringers to pick up in the other end of the county, so she had to cut us about fifteen minutes short. I was glad I had started early, then. As I was putting my horn away, a couple shoppers who had listened earlier said they'd really appreciated the music. One of the WalMart employees said he was surprised to see a real horn - he thought we had a sound track playing. So I went home feeling exhausted, but pretty good overall. We seemed to have boosted the giving, and, based on a lot of folks' comments, spread a little Christmas cheer in the bargain. When I got home I found that I had a blister on my lower lip. As a guitar and banjo player, I've put plenty of blisters on my fingertips, but that's the first blister I've ever put on my lip. Then nobody from the Salvation Army called me to come back and play again. True, a couple days later the temperature dropped below the point where they felt it was unsafe to have any kettles out. So maybe the timing was just bad. Of course, as a musician, I can't help interpreting a non-response as a negative response. So I couldn't help wondering if they had a problem with something I said or did while I was out. A few weeks later, though, I heard from the captain who said he had heard nothing but good reports, and he was sorry they couldn't have used me more. He hoped to be able to use me earlier in the season next Christmas. Okay, I felt better. And to be honest when the temperature dropped into the single digits, I wasn't as disappointed to be in a warm house as I probably should have been. We also indoctrinated a German-American visitor into our family version of "Oh Tannenbaum." This year, the Salvation Army Captain and I got into contact before Thanksgiving. That week, my sister Tess Hoffman (a longtime music teacher and a musician all her life) was down for a visit. So I suggested a vocal ensemble instead of just a saxophone for a venue the night of "Black Friday." He agreed and scheduled us to play in front of the Kroger on Bechtle Ave, Springfield. Shelia and daughter Emily made up the foursome. 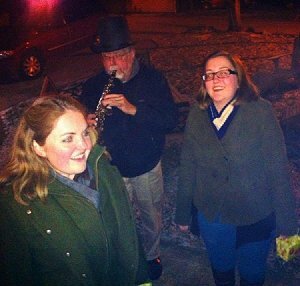 We sang for about an hour, picking the "peppy" songs out of a set of songbooks Tess had brought down for the purpose. Tess also brought down some hats she had bought for the purpose, and some tree skirts and trim that could be fashioned into capes. (As a music teacher, she's done this sort of thing before.) 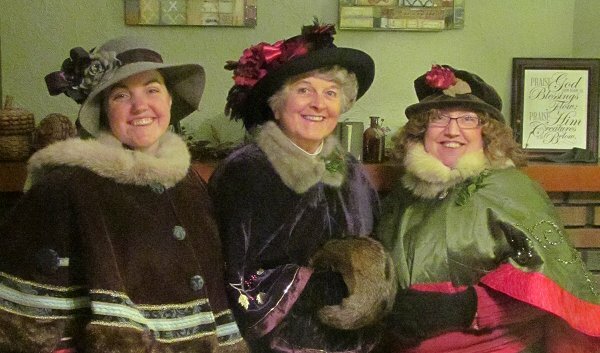 Tess and Emily trimmed the gray hat, which was untrimmed, and Tess sewed details including fur salvaged from old coats and stoles, onto the tree skirts to make them look festive. I wore my London Fog coat (a little anachronistic, I suppose) and the craft store top hat that Tess had loaned me for 2013. We cut holly from bushes in our front yard for a little extra trim. I also took my C melody sax,with the idea that I'd use it to establish the key of the songs before we started. But playing it only a minute or so at a time didn't work out the way I thought it would in the relative cold - I had to "warm it up" between songs, which caused too much of a delay. Maybe a pitch pipe next time? The first few minutes, hardly anybody dropped anything into the kettle. Instead, folks just looked confused as they walked past us. Apparently they didn't make the connection between us and the kettle, since we were dressed in "Victorian-inspired" outfits. So we borrowed the bell from the fellow who had been ringing and one member or another rang it as we sang. Then folks started going out of their way to give - including folks who took their groceries to the car and came back across the parking lot to give, as well as one of the young cart wranglers. I'm convinced it wasn't the quality of the singing as much as the fact that folks just appreciate someone trying to add a little Christmas cheer to an otherwise hectic week. Before we left, we asked the bellringer who relieved us to take a photo, but those didn't come out. So we took some ourselves when we got back to the house. (That's why we're not all in the same photo.) Altogether it was a rewarding experience. We had turned a plea for money into an experience folks appreciated, and there's no question that we substantially increased the amount of cash that went into the kettle. Since then, I have done another one-hour stint with my tenor sax and a one-hour stint caroling with my sister. On that day I took my tenor along and played a verse here and there to give our voices an occasional rest. Again, giving jumped exponentially, and a lot of folks seemed cheered. The one somewhat unnerving incident was when I was playing my saxophone and a fellow started recording my performance. "Please, Dear God, don't let me play any wrong notes as long as he's got that thing going." But I didn't hit any wrong notes, so that was okay. In the meantime, watching family after family change their expression from harried to cheerful is a reward in itself. Wherever you live, if you have any musical talent at all, contact your local Salvation Army and let them know you're available. It's always fun to sing with other people who love singing, but this time for us was made special by the fact that we knew were helping folks who really need help at the same time. 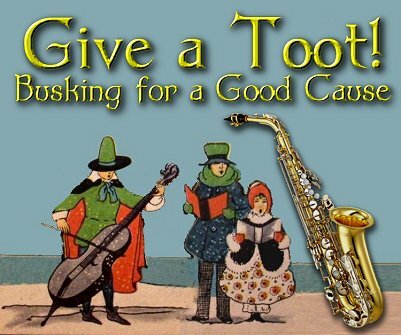 Any reasonably listenable musician or ensemble substantially increases the giving as long as they're playing, hint, hint. This time of year there are countless cries for help, many of them bogus. But this is a real organization who gives nearly everything that comes in to help real people with real needs. 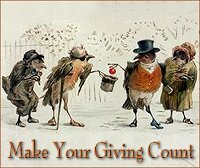 If you're struggling with wondering who to help and how, check out our article Make Your Giving Count. Once again, if you have musical talent and would like to use that gift to literally multiply donations to help folks in need, get in touch with the Salvation Army now. Or contact me with any questions, and we'll try to get back to you in a timely manner. Hopefully I'll have time, health, and chops to "busk" a lot more this Christmas season. Over the years, our family has helped (and even produced) with countless Christmas pageants, plays, cantatas, and the like. I've even preached a number of Christmas sermons. (In fact, our Could Christmas Possibly Come at a Worse Time?" article started out that way.) But as much as I enjoy all those other activities, "busking" for this good cause has been a great experience. Yes, I feel exposed as a musician, even in an ensemble. It's not like we were standing on a stage hiding behind microphones or something. The personal interaction with the givers is unique. And the rewards were immediate, or did good for folks who needed it: the harried shoppers, the cheerful givers, and the down-on-their-luck recipients. So if you live close enough to hear me practicing Christmas songs this summer when our windows are open, you'll have some idea why. If you're a musician and you wonder if you have what it takes to do this, practice up some carols and call your local Salvation Army office. Maybe in September, based on how long it took for my paperwork to go through. God bless you and give you the kind of Christmas season that builds grace - and graciousness - in your life. 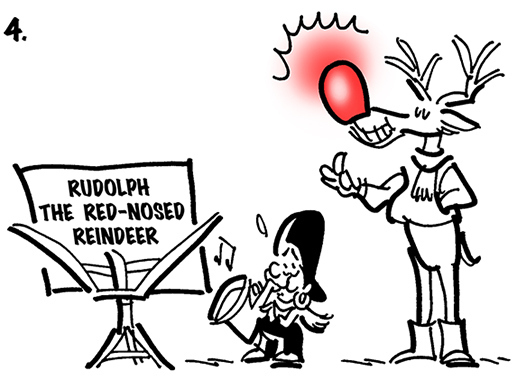 And here's one more note from our new friend Busker (and his creator Mark Armstrong). If you've been reading our pages, you know that we have more articles planned, and a lot on our plate, so keep checking back. And contact us with any questions or suggestions you have in the meantime. 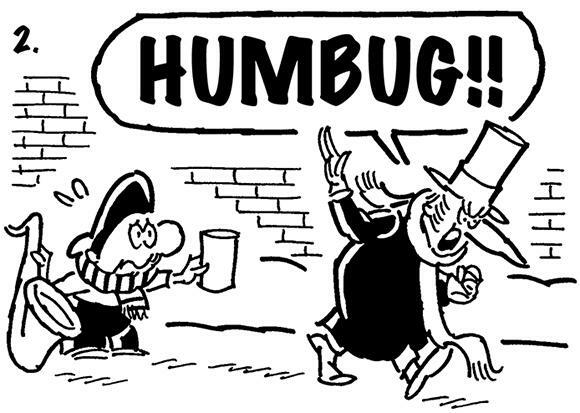 To return to the Christmas Musings page, click here. All information, data, text, and illustrations on this web site are Copyright (c) 2006, 2007, 2008, 2009, 2010, 2011, 2012, 2013, 2014 by Paul D. Race.